The blood supply of the adrenal gland is derived from the inferior phrenic artery, the abdominal aorta and the renal artery which give rise to the superior, middle and inferior renal adrenal arteries respectively. Variations deviations from this basic scheme exist. The venous drainage tends to be as a single adrenal vein. The adrenal cortex is divided into three layers, which from the outside in are the zona glomerulosa, zona fasciculata and zona reticularis. The zona fasciculata is the largest of the three layers. The cells of all three layers tend to be polyhedral but the layers are distinguished by the manner in which the cells are arranged and also by the cytoplasm of the cells. In the zona glomerulosa the cells tend to form clusters or balls whereas in the zona fasciculata the cells are arranged in long bundles that are orientated perpendicular to the surface of the gland, while in the zona reticularis the cells are grouped into cords that are arranged to give an appearance that resembles a net. The cells in the zona fasciculata tend to have pale cytoplasm. The adrenal cortex synthesises steroid hormones. The other main site of the production of steroid hormones is the gonads (ovaries and testes). The steroid hormones are all derived from cholesterol. Cholesterol is first converted into progestagens which can then be transformed into either glucocorticoids or androgens. The glucocorticoids themselves can then be changed into mineralocorticoids and the androgens can be modified into oestrogens. 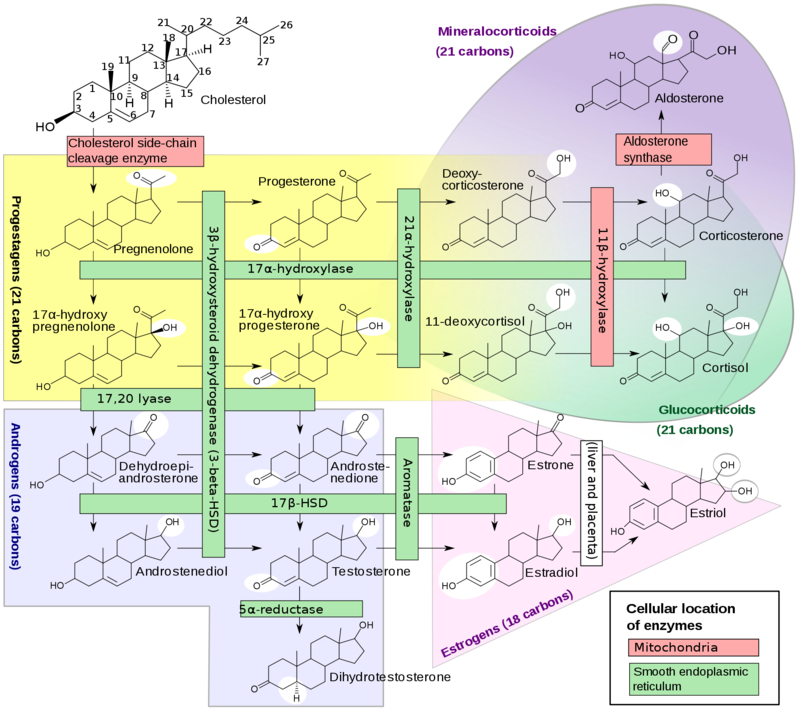 The metabolism of the various steroid hormones requires the synthesising cell to possess the relevant enzymes. For example, the cells of the zona glomerulosa, where the mineralocorticoid aldosterone is made, have the enzyme aldosterone synthetase; other parts of the adrenal cortex (or the gonads) lack this enzyme. Thus, the differential expression of enzymes by different cells allows the cell to specialise in making only a selection of the possible steroid hormones and also ensures that the cell is not obliged to take the metabolic pathway through to the absolute endpoint (oestrogens, aldosterone and cortisol) of the synthetic tree. The zona glomerulosa is the site of mineralocorticoid production. The zona fasciculata deals with the synthesis of glucocorticoids. The zona reticularis is concerned with the manufacture of androgen precursors. These are released into the blood to be used by the gonads. Some generation of the glucocorticoid cortisol also occurs. The main mineralocorticoid is aldosterone. Aldosterone acts on the distal tubules and collecting ducts of the kidney to promote the retention of sodim and water and to enhance the excretion of potassium. The effects of aldosterone on the nephron include the induction of a sodium-potassium exchange ion pump and increasing the permeability of the tubular epithelial cells to sodium. It therefore has an important role in regulating the circulating volume and blood pressure. The main stimulus for the release of aldosterone is angiotensin II. Angiotensin II is in turn generated from angiontensin which is itself produced from angiotensinogen by the action of renin. Renin is released by the juxtaglomerular apparatus of the kidney in response to a low circulating volume either through local sensing by the juxtaglomerular apparatus itself or by sympathetic stimulation (the precise mechanisms and triggers are complex but the basic stimulus is a low blood pressure / blood volume). Aldosterone release can also be stimulated by a raised blood potassium. Adrenocorticotrophic hormone, which is central to the regulation of glucocorticoids, has only a minor influence on aldosterone and such effect as there is probably relates to the ability of ACTH to induce the production of precursors of aldosterone. The principle corticosteroid is cortisol (also known as hydrocortisone). Glucocorticoids have more diverse mechanisms of action than mineralocorticoids and are also regulated in a different manner. The production of glucocorticoids is stimulated by adrenocorticotropic hormone (ACTH) which is released by the anterior pituitary gland. ACTH is a peptide hormone that contains thirty-nine amino acids. The secretion of ACTH is stimulated by the release of corticotropin-releasing hormone (CrH) from the hypothalamus. ACTH is generated by the cleavage of a larger molecule, preproopiomelanocortin. The cleavage of this precursor molecule yields endorophins and melanocyte stimulating hormones as well as ACTH. The glucocorticoids are key players in the metabolism of glucose and in assisting the stress response. Hepatic gluconeogenesis is stimulated by glucocorticoids. To facilitate this process glucocorticoids promote the breakdown of proteins, including those within skeletal muscle, in order to provide raw materials for gluconeogenesis. While muscle catabolism is not ideal in the long term, in the short term, in a fasting situation, it may be crucial for the preservation of blood glucose. Glucocorticoids do not stimulate glycogenolysis themselves but facilitate this action of glucagon and thus are able to help elevate blood glucose by assisting in the liberation of the glucose reserves in glycogen. As well as elevating the levels of blood glucose, glucocorticoids inhibit the uptake of glucose by skeletal muscle and fat. Skeletal muscle can use fatty acids as an alterative source of energy, thus preserving the glucose for the brain. Lipolysis is promoted by glucocorticoids and this provides further substrates for gluconeogenesis, as well as offering an alternative energy source to glucose for skeletal muscle. The creation of ketone bodies is increased by glucocorticoids. Glucocorticoids have weak mineralocortocoid actions althouh these effects are usually neglible compared with aldosterone at normal levels. However, glucocorticoids also have additional actions on the kidney. They enhance the glomerular filtration rate and are crucial in the rapid excretion of a large water load; glucocorticoids can reduce the effects of antidiuretic hormone on the kidney. Calcium excretion by the kidney is enhanced by glucocorticoids. The action of catecholamines on vascular smooth muscle is potentiated by glucocorticoids and glucocorticoids are thus involved in the preservation of blood pressure. Glucocorticoids also have actions on the central nervous system, particularly the limbic system. Moderate levels of glucocorticoids assist the formation of memories that are related to emotional stimuli, although both low and high levels of glucocorticoids impair this phenomenon. The particular focusing of the effects of glucocorticoids on the limbic system has implications for mood in diseases of glucocorticoid metabolism. The synthesis of collagen is inhibited in both skin and bone by glucocorticoids. Glucocorticoids are necessary during in utero development to permit maturation of various tissues, including the lungs and brain. Glucocorticoids inhibit the inflammatory and immune responses. Phospholipase A2, which releases arachidonic acid from membrane phospholipids, is inhibited and thus the arachidonic acid cascade is blocked. The migration of neutrophils from the blood into tissues is impaired. T cell activity is suppressed. In addition to any stimuli that may affect the release of glucocorticoids (hypoglycaemia, stress, fear and pain), the levels of glucocorticoids have a diurnal rhythm, being lowest around midnight and highest in the early hours of the morning.